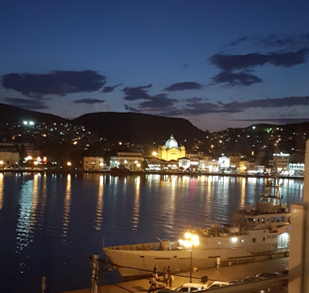 Ella Alexander, Pro Bono Senior Associate at Makinson d’Apice Lawyers, shares her experience of pro bono lawyering on the frontline of the refugee crisis in Lesvos. At the start of this year, the UNHCR reported that we are facing the greatest refugee crisis in history. Nearly 70 million people worldwide have been forced to flee their homes – the highest number of displaced people on record. With suffering of this scale, it can be overwhelming to think about what we can possibly do to help. Thankfully, there are many organisations both in Australia and abroad that provide training and opportunities for lawyers to use their legal skills to assist refugees. 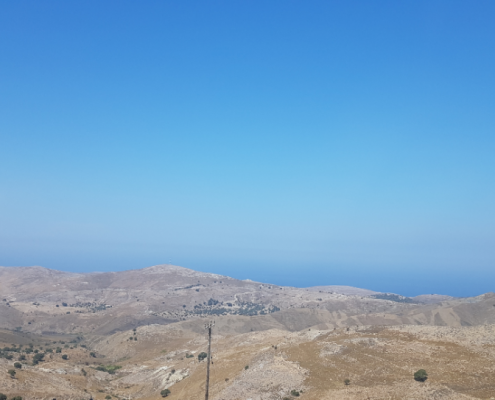 In August I set about finding an organisation that would accept volunteers for short term placements on the Greek Aegean islands. Lesvos is an idyllic holiday destination known for its charming villages and picturesque landscapes. However, in recent years it has gained notoriety as one of the main gateways to Europe for the hundreds of thousands of refugees fleeing conflicts in the Middle East and Africa. After securing a last minute placement and completing my online training on Greek asylum law and procedure, I embarked on a 3 week pro bono secondment to an NGO which operates in a number of locations in Greece. When I arrived, there were over 11,000 asylum seekers stranded on Lesvos awaiting the outcome of their applications for refugee status. I learnt that having legal representation improves an applicant’s chances of being granted a protection visa by up to 30%. However, there are only a small handful of lawyers on the island working with asylum seekers – many of whom, like me, are short-term volunteers with international NGOs. As such, the vast majority of asylum seekers are unrepresented. The coastline of Turkey is visible from of Lesvos, being only 8km away at some points. Many asylum seekers drown making this short boat trip. My time on Lesvos was divided between running legal aid clinics with the 4 other volunteer lawyers in my organisation and preparing clients for their asylum interviews. At the clinics we provided advice about anything from family reunification to procedures for unaccompanied minors. Interview preparation involved writing statements outlining our clients’ protection claims and gathering evidence to back up these claims. I have never felt further from the comfort of my corporate law offices than when I was conducting meetings with clients in 40 degree heat while sitting on the dirt under the shade of an olive tree! The presence of military ships juxtaposed against the picturesque scenery served as a reminder of the tragedy that was unfolding behind the scenes. My clients’ stories were harrowing. One client – Jonah* – had been arrested and tortured in his home country for suspicion of involvement in a political movement. After informing Jonah of my duty of confidentiality and building trust with him over a number of meetings, he told me that he had acquired HIV during his time in prison as a result of brutal group beatings. He had been afraid of disclosing this diagnosis to the Greek authorities in case he was deported. As such he had gone without treatment for a number of months. I was able to arrange for him to access the medical treatment that he so desperately needed. 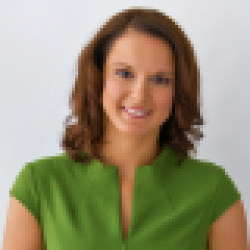 I identified particularly strongly with another refugee – Tania* – who was a 29-year-old lawyer, just like me. Tania had been forced to flee her country because the government had issued a warrant for her arrest. Why? Because she had spoken to the media about the murderous rampage of government troops in her country which had resulted in her village being burnt to the ground and members of her family killed. This incident was well-documented in Amnesty and Human Rights Watch reports. Samuel* was acutely suicidal and suffering from severe post-traumatic stress disorder. His medical notes revealed that he spent his days hiding in the forest to avoid the guards who reminded him of being tortured in prison in his home country. At our first meeting, he barely met my eyes and answered in monosyllables. However, at the end of our final meeting he shook my hand with a big smile, saying that he was now confident about going into his interview and thanking me for giving him hope. I have since heard that a number of my clients have now been moved off Lesvos and into proper accommodation on the mainland after passing the initial stage of the visa application process. This means that they will not have to spend this Winter freezing in the flimsy tents that spill out into the fields surrounding the overcrowded refugee camp, or put up with the constant fights and the rivers of sewage that you can smell hundreds of metres away. It was devastating to realise that behind every statistic there’s a tragic story like those of Jonah, Samuel and Tania. Yet my experience in Lesvos reminded me why I’m so passionate about the work that we do as pro bono lawyers. As individuals, we may not be able to change the world. But I strongly believe that we can make a difference to one person at one point in time, even if it’s just by listening respectfully to their story and recognising their human dignity. And that’s good enough for me. 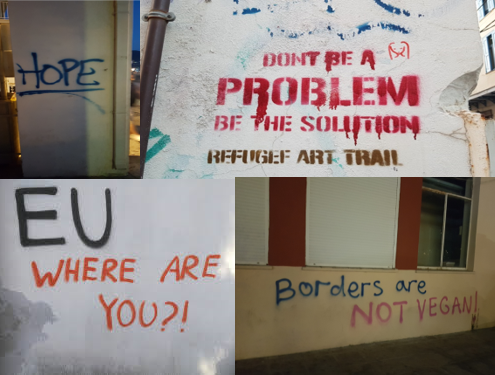 Images from the refugee art trail in Mytilene, the capital of Lesvos. * Not the refugees’ real names. The 11th Annual Performance Report on the National Pro Bono Target (2018) What needs to change in the legal profession so women can thrive?